Here is a little-appreciated principle: Accompanying every dream is a fear. 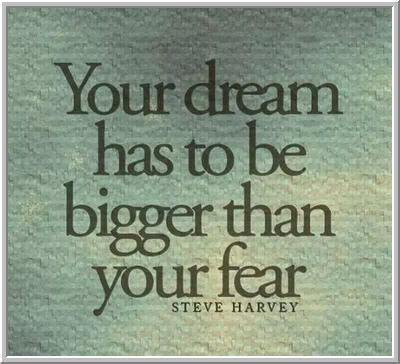 Very often, the greater the dream, the greater the fear. The fear manifests itself in many ways, not always as outright anxiety. Sometimes the fear shows up as excuses that keep us from moving forward. Sometimes the fear takes the form of procrastination; sometimes it shows up as a fatigue and a suppression of our drive. Yet other times, the fear is a direct fear of failure, hesitancy to take risks on the way to reward. Why do we fear at the same time we dream? It's not that we're sabotaging ourselves, though continually giving into fear can end up derailing our quests. No, the fear shows up whenever there is uncertainty and change--whenever we prod ourselves out of our comfort zones. Any worthwhile goal entails a shift from the status quo, and those shifts take effort. They are not comfortable. Fear is our conserving force, tethering us to what we know and where we're safe. Fear preserves the status quo. In many respects, this is adaptive. If we were wired for easy and continual change, we would find it difficult to navigate life's many routines. Instead, we're wired for habit patterns, and those make us more efficient. They allow us to get things done, while saving finite willpower resources for challenging situations. Once we exit our habit patterns, we extend ourselves and we expend resources. We introduce uncertainty and the unknown. And that's when fear kicks in. So how do we overcome fear and clear the path to our goals? Here is where the Naomi Principle kicks in: we can best overcome negative emotional experiences by tapping into stronger, positive ones. Imagine if we encountered a person whose sole mission in life was to keep us from achieving our dreams and thwarting our fulfillment. We would actively avoid that person; we would actively confront that person; we would take every action to minimize their impact upon us. They would become our enemy. We would find ample motivation to not allow our enemy to win. In short, our positive desire to fight for ourselves and win our freedom would overcome any fear or uncertainty we might experience. When we visualize fear as that person standing in our way--as our enemy--we can summon that will to fight for ourselves. It's easy to give into procrastination, but if we clearly identify that procrastination is just another face of the enemy--just another form of fear--then we can ask ourselves, "Who do I want to win today: me or my enemy?" It's much harder to avoid that workout or prematurely bail out of that trade if we replace flight mode with fight mode. Anger, channeled as the will to defeat an enemy, is a more powerful--and more positive emotion than fear. That's what moves athletes and soldiers forward on the field: the desire to not let the opponent get the best of you. When our dreams are bigger than our fears, we will fight for those dreams. No amount of reasoning, journal writing, or analysis ever got someone past a fear. Only fight beats fright: we achieve our dreams when we truly fight for them.